Steve Marriott was one of the music world's most extraordinary individuals, A supremely gifted songwriter, singer and … schemer. A vocalist from the same mould as Rod Stewart, Eric Burdon and Steve Winwood … but arguably the greatest white soul singer of them all. Marriott never held back from anything, least of all his music, his vocals always possessed an intensity, clarity and maturity that at the time were unmatched by any other singer. His band The Small Faces were the first to be banned from Top of The Pops and were deported from Australia at gunpoint. Steve's next group Humble Pie ruled the stadiums of America but the money earned was diverted by mafia associates and he returned to the UK broke and on the run from the Taxman. In later life he struggled with schizophrenia but always continued playing - blistering gigs in front of small audiences in the pubs and clubs around London. Recently reunited with his old Humble Pie sparring partner Peter Frampton, he was on the verge of a comeback when he was tragically killed in a housefire, aged 44-years-old. A huge influence on a new generation of musicians from Paul Weller to Noel Gallagher, due to his death, Marriott has perhaps not been granted the status in Rock’n’Roll's pantheon that he deserved. A major reassessment is long overdue. 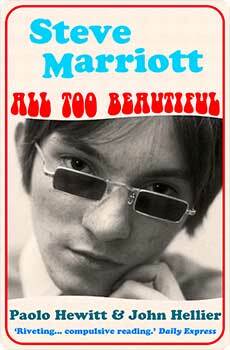 Marriott was simply one of the greatest rock stars of all time.